﻿ Gabion, an ancient technique that still works for your garden. - Anping County Zhuoda Hardware Mesh Co., Ltd.
Gabion, an ancient technique that still works for your garden. They are a legacy of trench warfare, of ancient Nile shore stabilization, and later they evolved into the gabion of today. In ancient times, gabions were huge wicker baskets of willows woven to create stable protective barriers without concrete. Each basket was filled with rocks if available, or soil if not. Rock-filled gabions remained long after their "baskets" rot away. Eventually these become bound by roots of trees and shrubs that naturalize there. This ensured that bank protections would last far longer than the baskets, solving erosion issues of high water and flood well into the future. Today's gabion has come out of the engineer's tool box and into our gardens. This really ancient yet simple technology is a great building idea for your garden or landscape because there's no footing required. All you need are rocks and woven wire mesh. The process creates a standing tube or square out of your wire panels. Piece them together and secure with wire, then fill tightly with rocks. Anchor with stakes deep into the ground and voila, you suddenly have a stone column centerpiece for that new herb garden. For garden makers, the presence of rock on a site is usually a problem for digging and grading etc. Often it's a lot of field stone scattered all over with nothing big enough to use as landscape boulders. Because gabions are created with smaller rocks, they're the most affordable choice for home gardens. Search "how to make a gabion" on YouTube to see it done first hand, learn tips, tricks and great design ideas that other rock strewn gardeners have discovered and perfected for you. In the city, few homes are large enough to generate their own rocks. This is where costs rise but they can be managed to offset the hauling charges of bringing in gabion rock. Where the budget allows, gabions can be filled with really uniquely colored stone that works with the overall palette. Another option are the rubble of urban renewal such as broken brick, block and concrete, which can also be used in gabions. When uncommon natural minerals such as mica are used that feature beautiful colors and textures, a one of a kind element results. 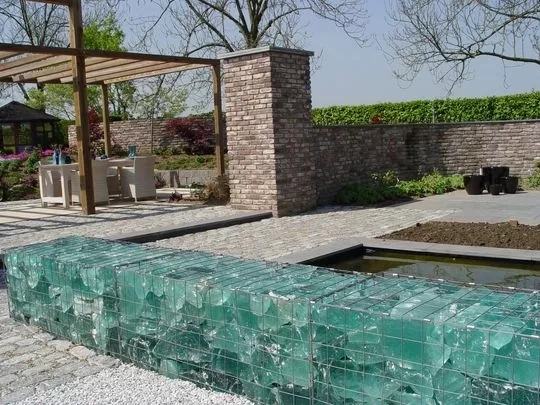 Some are using glistening recycled slag glass in gabions to create landscape partitions that offer visual lighting changes throughout the day. These can also be constructed with interior uplighting so the lass can be illuminated after dark. What really matters with gabions is making sure the mesh you choose has holes small enough to prevent the rocks from falling through. The bigger your fill rocks, the more open the grid can be. Some create their own grids from concrete reinforcement bar welded to offer a different take on the basket where bigger fill materials demand a stronger cage. Because gabions don't require footings, they can be built anywhere and at any time. They are the most doable recycling project for do-it-yourselfers today. While companies are manufacturing gabion "forms" out of metals for upscale landscapes, these are very expensive. Some are powder coated for design purposes while others are left to rust. Above all, choose local rock sources to fill your gabions to limit the energy costs of hauling fieldstone. In wilder sites, try to stick with indiegnous stone so they blend in with the local design vernacular. For modern give them standout differentiation for linear ad form based elements in gravel gardens. I have said many times that there are no new ideas, only the applications change. Gabions are a perfect example of a truly ancient technique for building that dates back to ancient classical civilizations. The only difference is that we quit weaving transient baskets and began using steel that lasts far longer while revealing the beauty of stones inside. 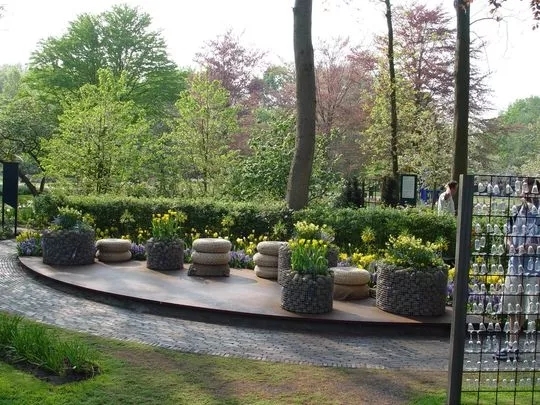 Instead of buying a prefab piece of garden art found in hundreds of other gardens, try the craft of gabion making to go into the future through the past.